So, in addition to researching my own family tree, I’ve naturally done quite a bit of research on my wife’s tree as well. In many respects, I’ve actually been more successful researching my wife’s family tree than my own. And because of that, I feel like I’ve connected with her ancestors in a way as if they were my own ancestors. 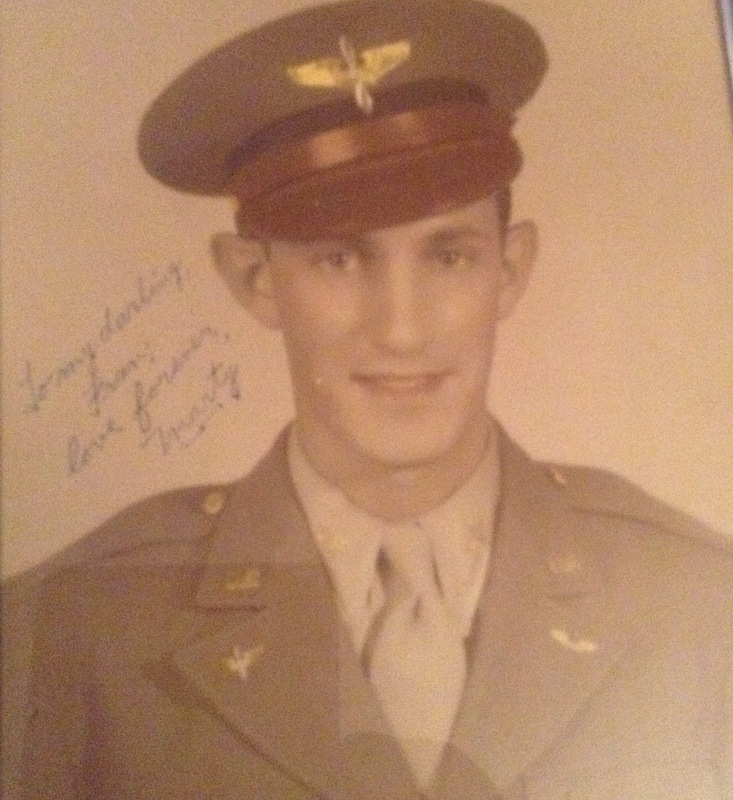 For me, finding an American progenitor is an awesome accomplishment. A progenitor is the first of your family name. So, in this regard, we are looking for the very first of your name in America. In my tree, I have found all of my progenitors and all of them are European immigrants that came to the United States at the turn of the 20th century. My wife’s tree is very different. 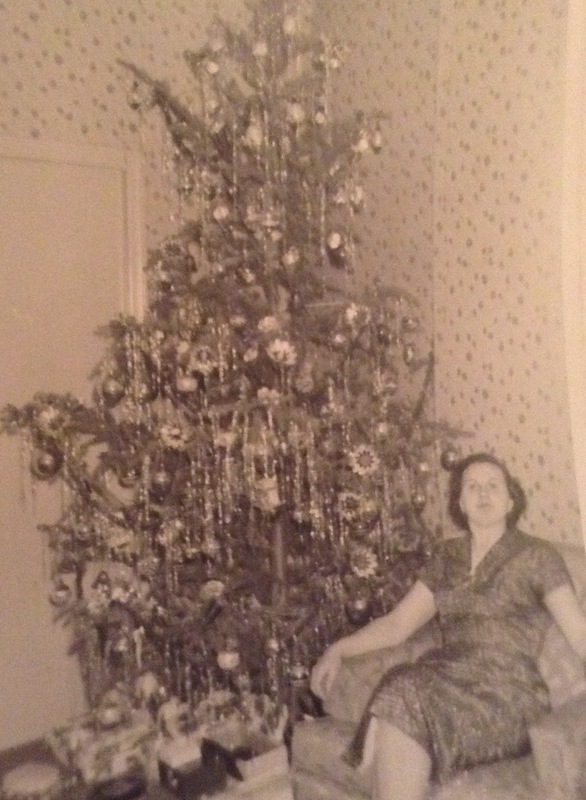 A number of her branches have deep American roots dating back to the 1600s. 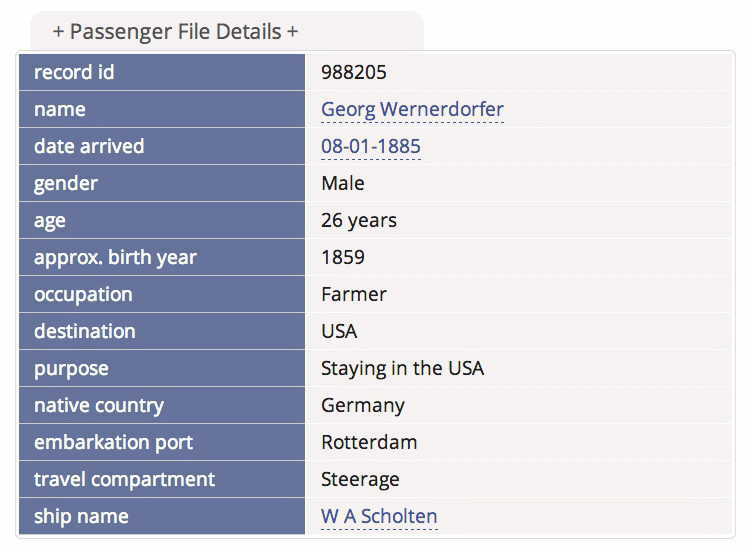 However, in this post, I am going to focus on our trip to visit The First Wernsdorfer – George – who like many of my ancestors was the first one of his name to come to America from Germany. 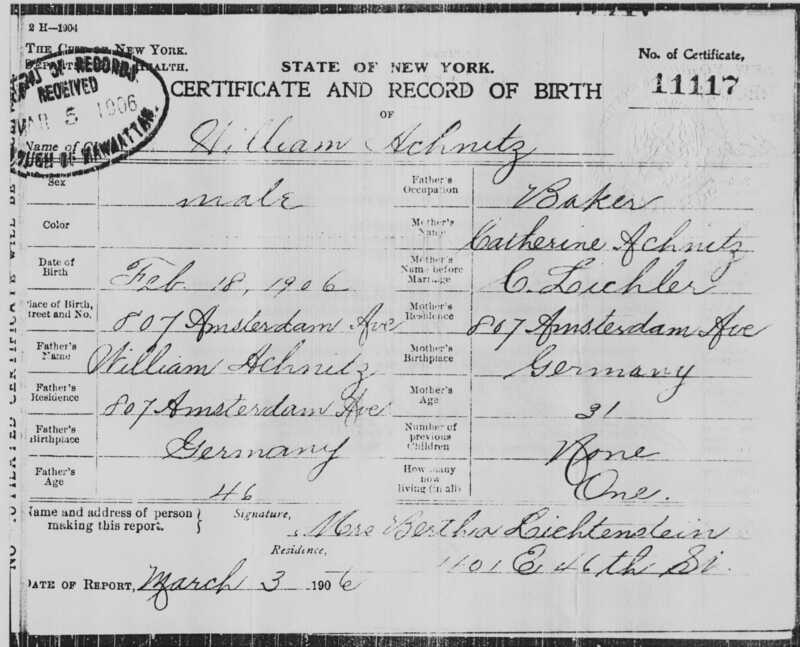 George, according to his death certificate, was born on July 22, 1859 in Germany. 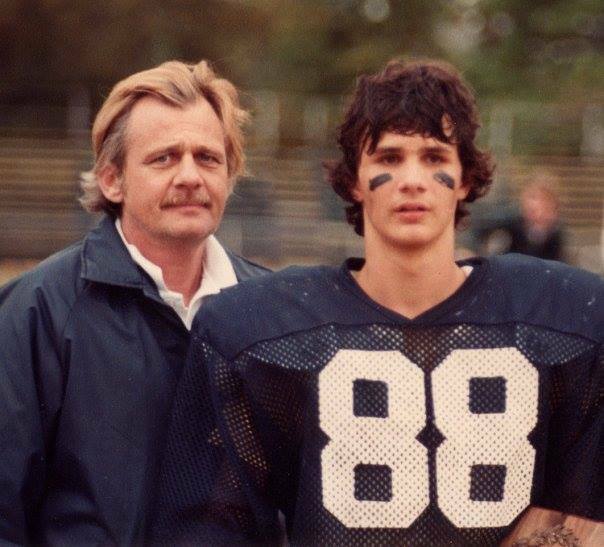 His life story is an interesting one and definitely one characterized by hard work and determination. On August 1, 1885, George left his homeland of Germany, where he was a farmer, to come to America. 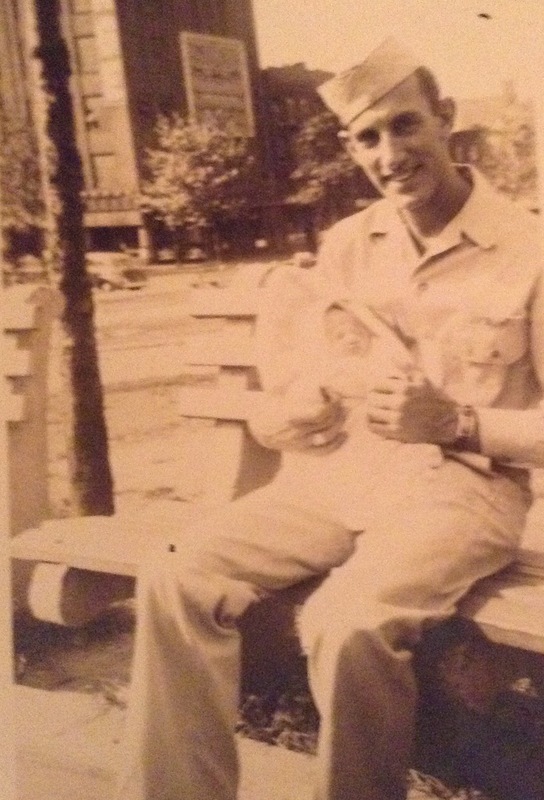 From what I am able to tell, the first job that George took in America was as a hostler in Brooklyn. A hostler is a man employed to look after the horses of people staying at an inn. I don’t think there are too many hostlers nowadays in Brooklyn. Certainly this was a hard job and definitely not the most glamorous. However, it was the beginning of a new life in a new country for a man that would work hard every single day of his life. In 1892, we see George with his first wife Elizabeth and his two daughters, Barbara and Louise. 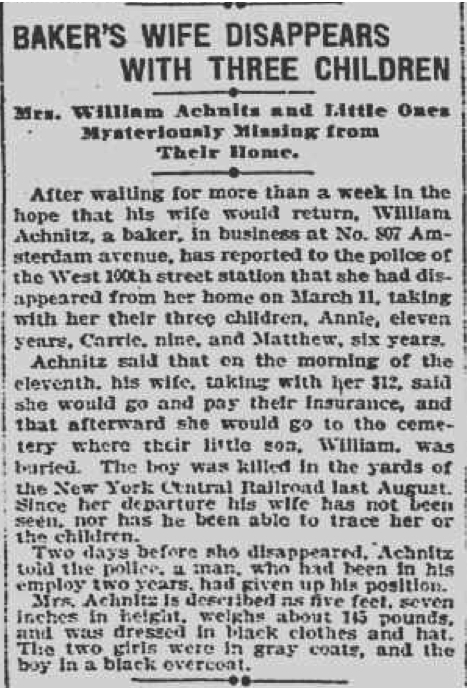 On January 5, 1899, something tragic happened. 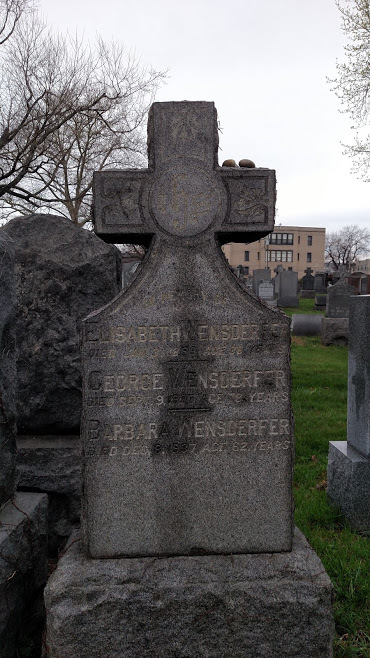 George’s wife, Elizabeth Wernsdorfer (nee Moser) passed away, leaving George to care for their two daughters and two sons. I have not purchased Elizabeth’s death certificate yet. Therefore, I do not know exactly what happened to her. She is listed as being buried with an infant though. 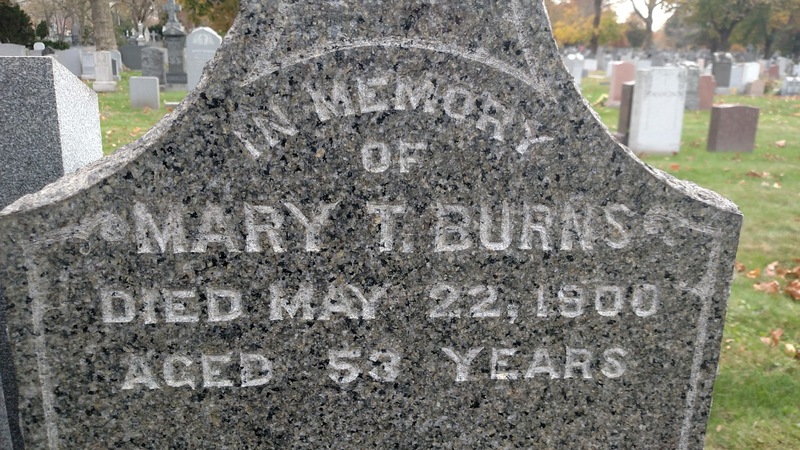 So, I am assuming that she died while giving childbirth. 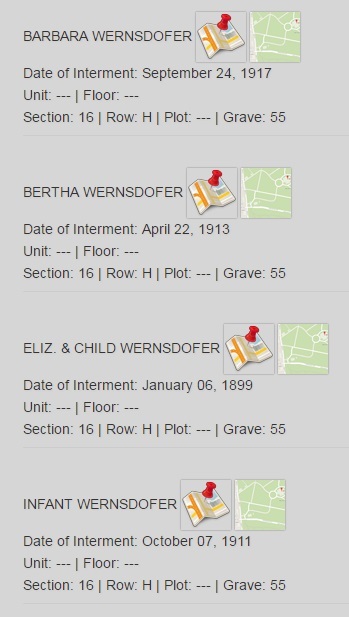 From the above screenshot of the Locate A Loved One search results, we can see that both Elizabeth and her child were buried together in 1899. 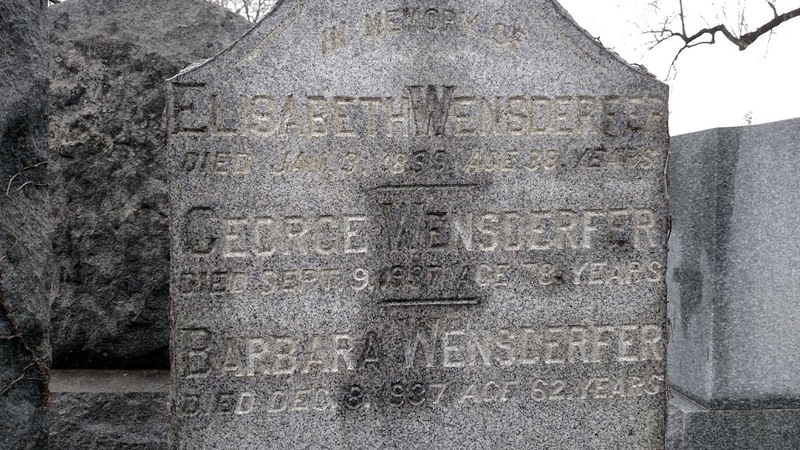 The other Wernsdofers shown in the search results were children of George and Elizabeth’s son, John Wernsdorfer and his wife Dorothea. 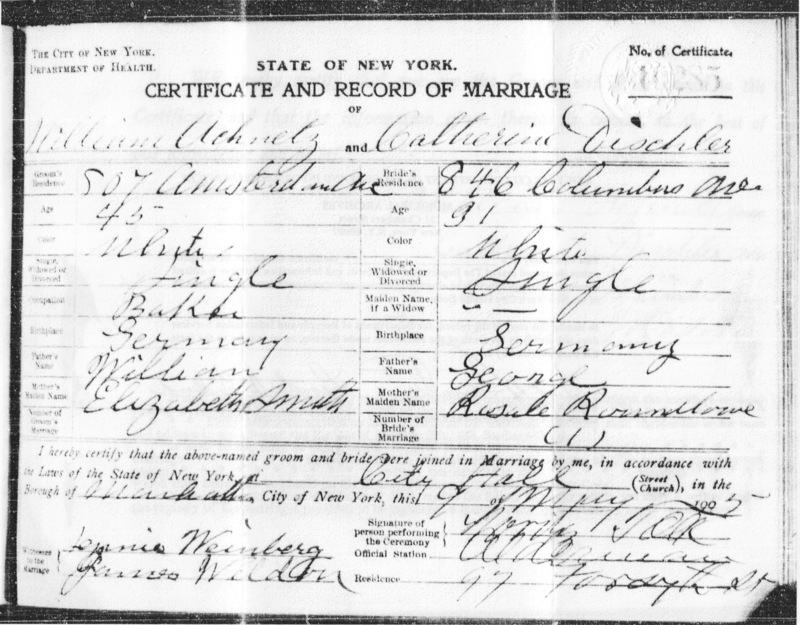 About 8 months later on October 15, 1899, George married Barbara Thomann. 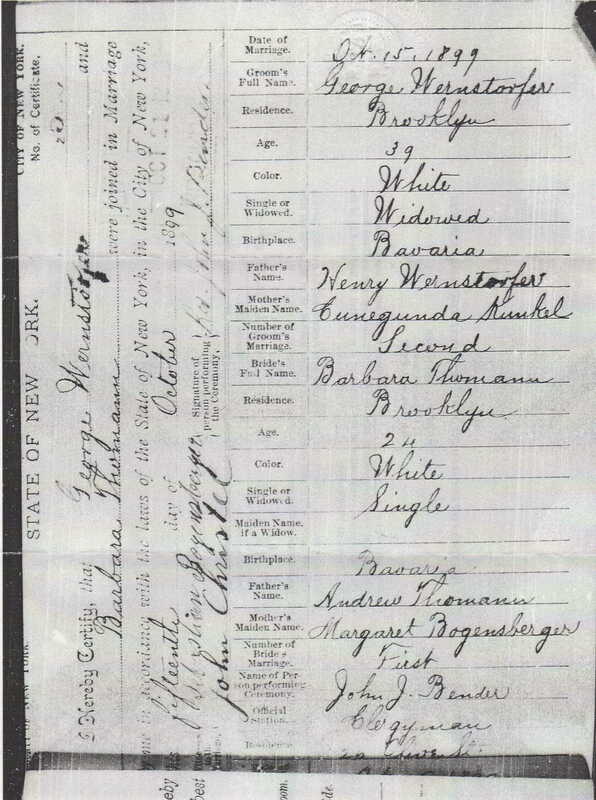 In the 1900 Census, we see that George is living in Brooklyn with his second wife Barbara and his children from his marriage with his first wife Elizabeth (Barbara, Elizabeth aka Lizzie, John, and George). In 1900, George is listed as being a driver. 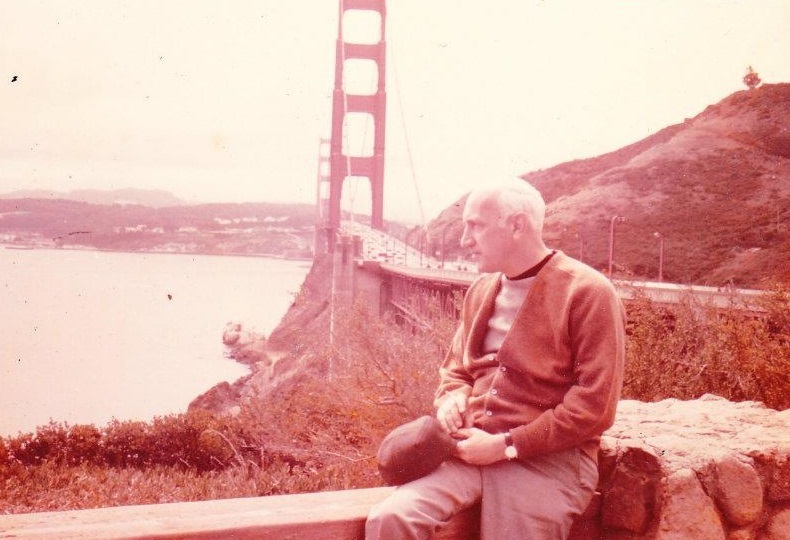 I did not know what kind of driver he was at this time, but as you will see later in the post, he was an ambulance driver for a hospital for many years. 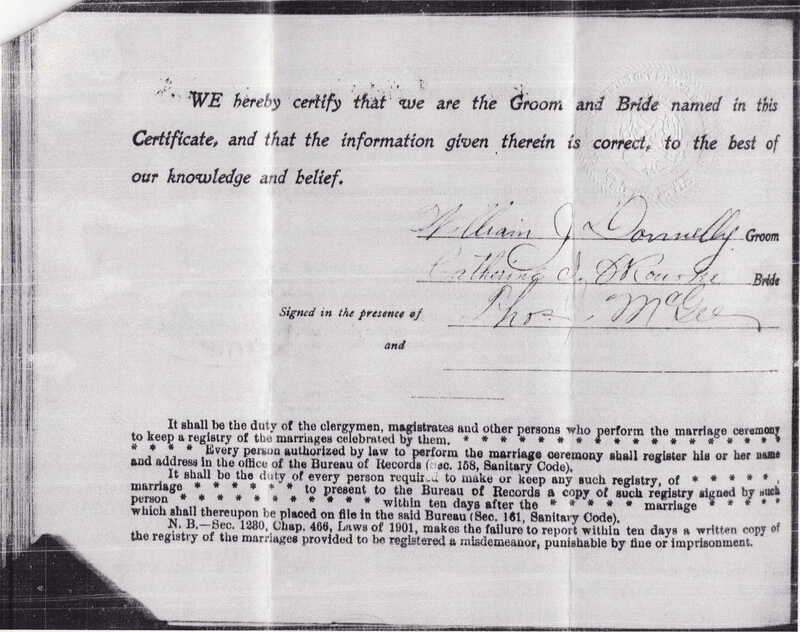 Here is the marriage certificate for George Wernsdorfer and Barbara Thomann. 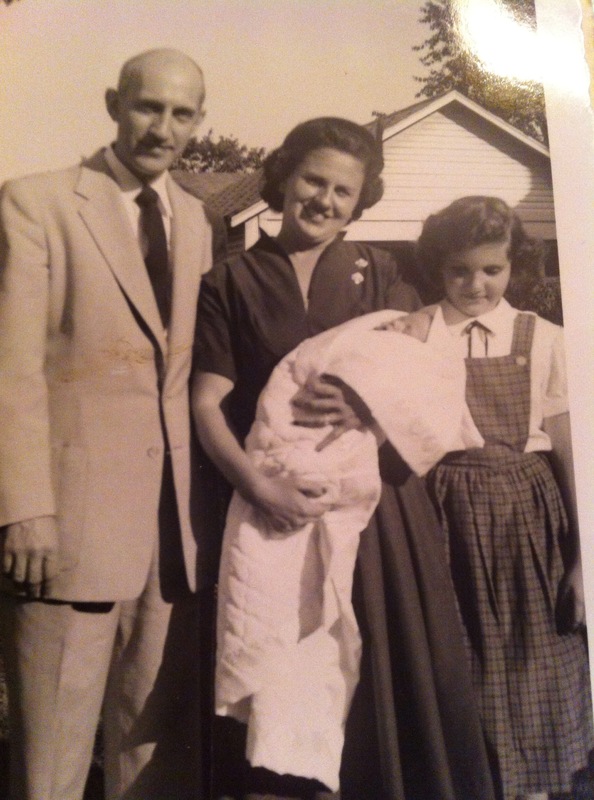 In 1905, Barbara and George have had their first child together, a son named Joseph. In 1910, George is still listed as a Coach Driver. His eldest child Barbara has moved out and is probably married by this time. His second daughter Lizzie is working as a book binder. 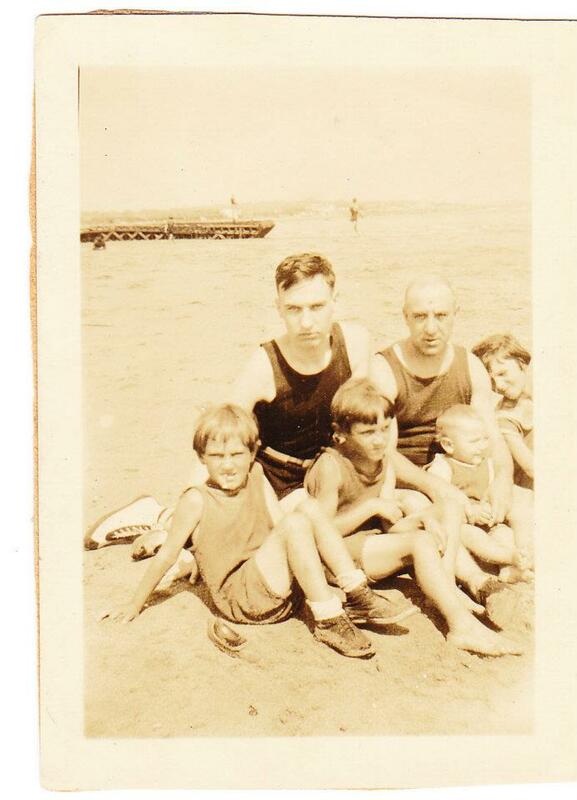 His eldest son John is working at a gas company and both George and Joseph are in school. By 1915, George is listed as a hospital driver. John has moved out and is now married to Dorothea. George and Elizabeth still have the same professions and Joseph is still in school. 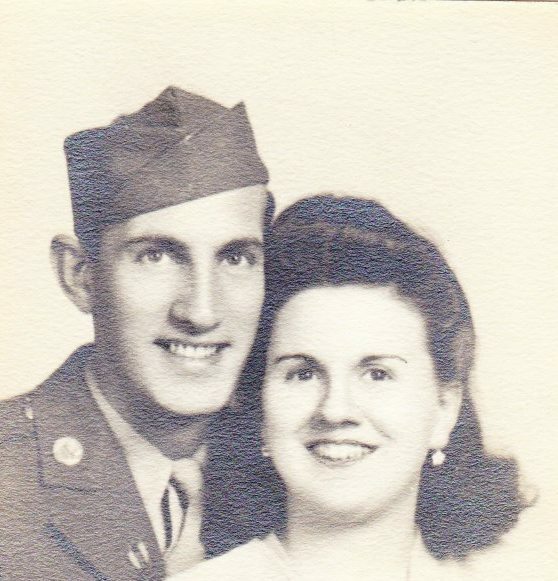 Through the 20s and 30s, George and Elizabeth eventually moved out, getting married, and starting their own families. Elizabeth (1890-1964) married a Peter Joseph Bogensberger (1891-1944) in 1921 and had two children. 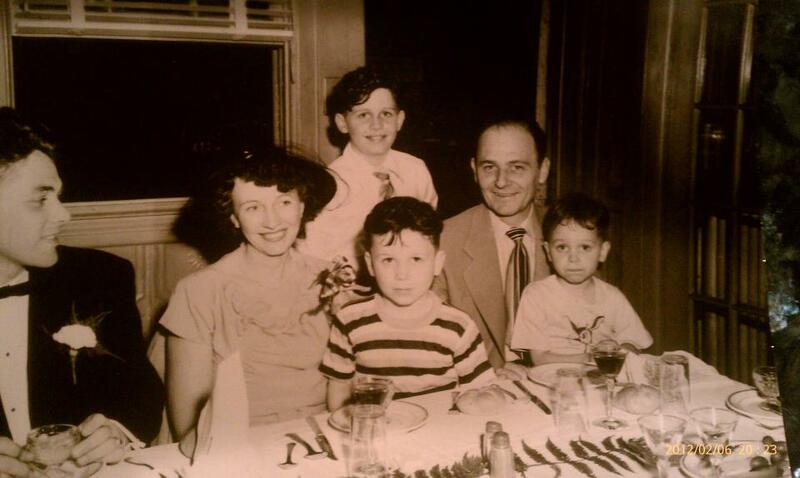 George (1896-1966) married Augusta S. Luckner (1902-1983) and had five children. 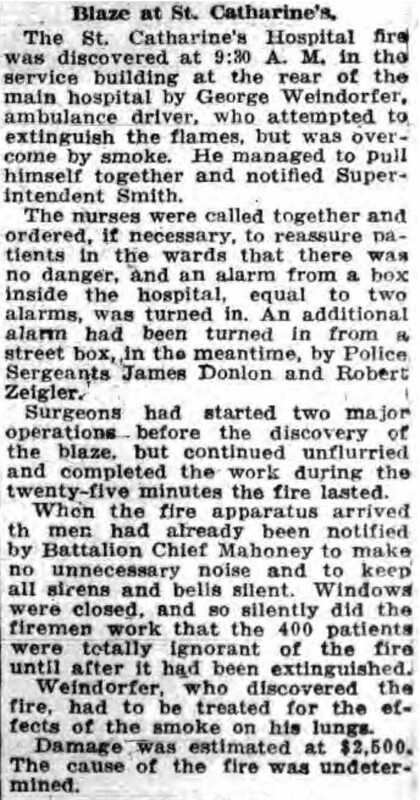 The elder George Wernsdorfer continued working as an ambulance driver for St. Catherine’s Hospital for many years. One significant highlight that happened during his career was his efforts in trying to put out a blazing fire at St. Catherine’s Hospital. See article below. From farming in Germany, to picking up after horses during turn of the century New York City, to driving an ambulance for St. Catherine’s Hospital in Brooklyn for decades, George Wernsdorfer worked hard every single day of his life. He literally worked until the day that he died, which also happened to be at St. Catherine’s Hospital. 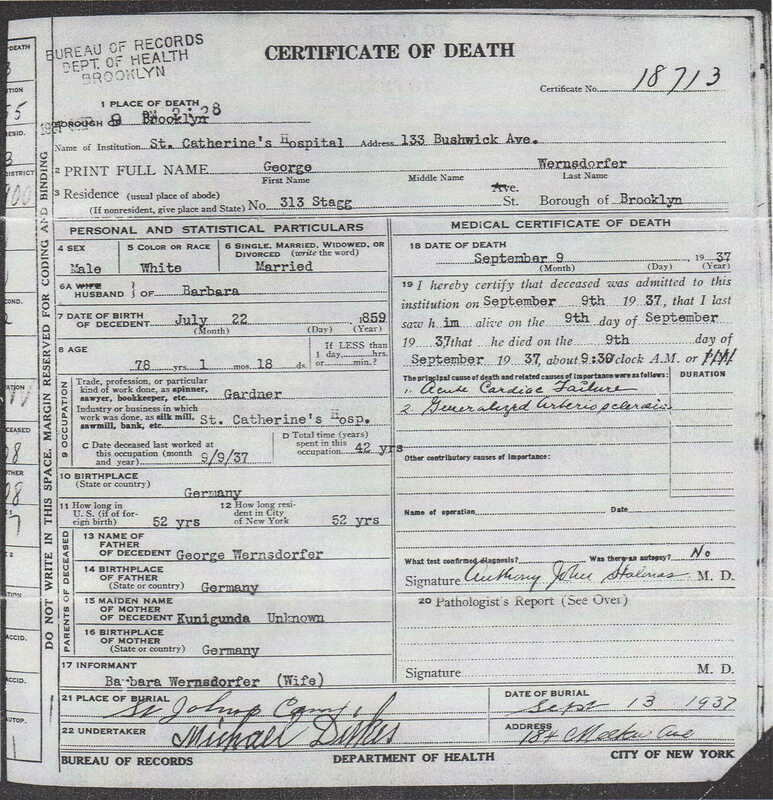 As you can see, at the age of 78, George Wernsdorfer who was still working at St. Catherine’s Hospital, died at 9:30 in the morning on September 9, 1937, at St. Catherine’s Hospital. Now, obviously much older, it appears he had made a transition from ambulance driver to the much less stressful job of gardener at some point in the 1930s. What a remarkable journey. George, the First Wernsdorfer, worked hard to make it in this country. He literally died working, which I am confident is something he loved. Who works until their 78? Not many. George without a doubt gave his family members more than he had and he taught them the value of hard work. 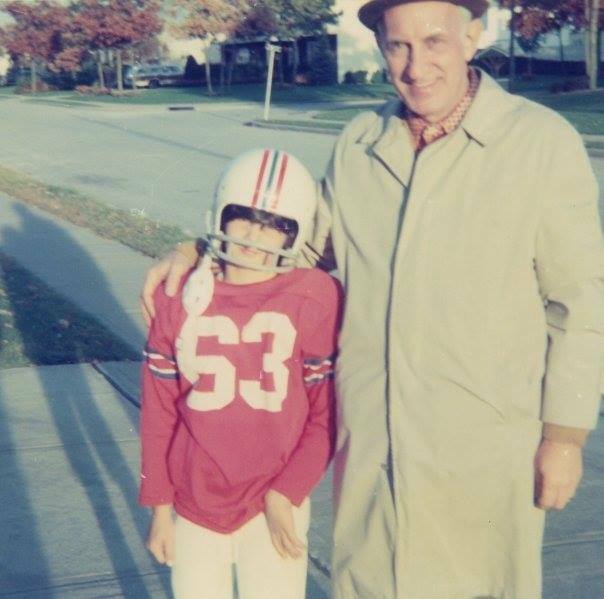 Without his dedication and work ethic, I am confident that things would have been much different for the generations that came after. Thank God for George! It was a pleasure visiting you. George is buried at St. John’s Cemetery with both of his wives Elizabeth and Barbara. 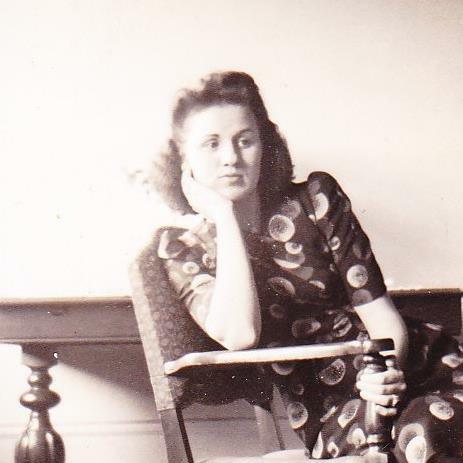 Barbara passed away on December 8, 1937, about 3 months after George. 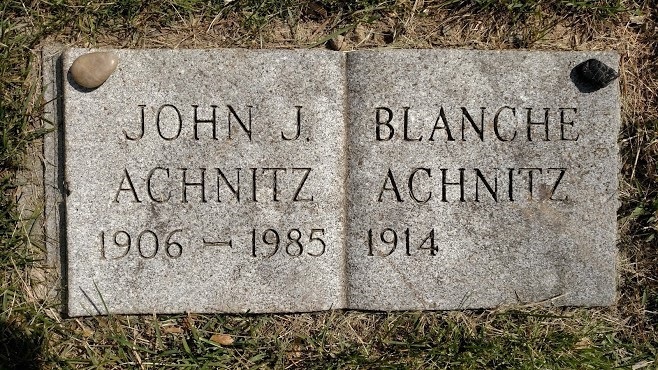 As you can see, there are only 3 names inscribed on their headstone. 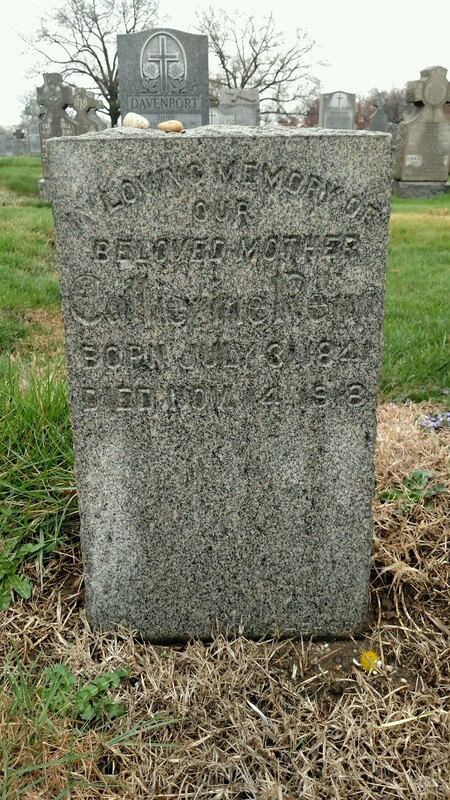 However, they have children and grandchildren that were buried there as well with them. 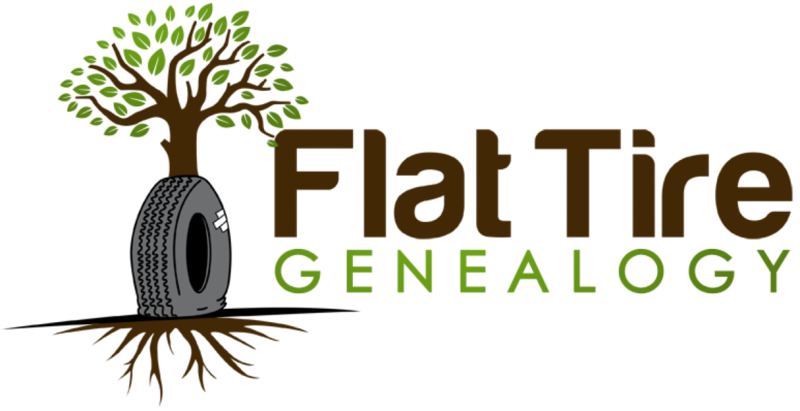 One of my main goals with Flat Tire Genealogy as I have expressed in many of my other posts is to make sure that all of our ancestors are remembered. Please support this page and share it with others because all of the money that I make from these efforts is going to go towards adding the names of those that have been forgotten to their headstones. I hope you enjoyed this last post in my Trip to St. John’s series. Please stay tuned for much more content in the coming weeks and months! 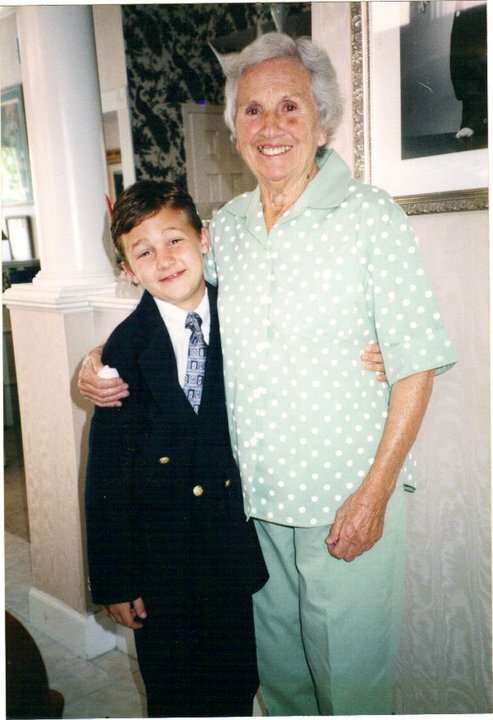 One of the best ways to make new discoveries in your family tree is to speak to your elders. Almost always, this is going to be the first step anyway. However, sometimes we don’t revisit those old conversations or we forget certain details that were brought up before. Hence, why it’s always important to write things down (something I tend to not do). 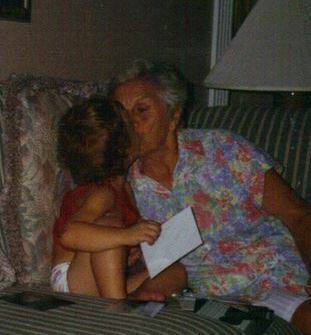 However, I always try to make it a point to talk about any new developments with my family tree with my grandmother. 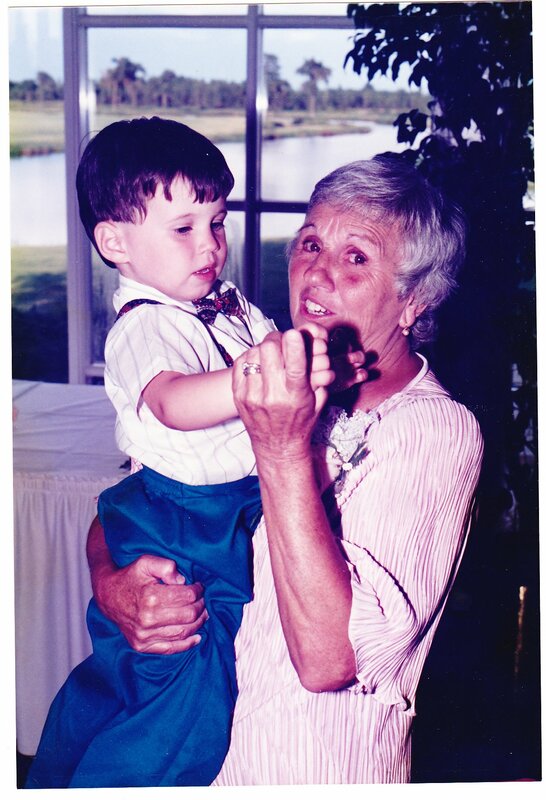 Oftentimes, a new discovery that I made will spark a memory of hers that we hadn’t talked about before. It’s also a good way to confirm that what you found was indeed correct or at the very least tell you that you are on the right track. One of my favorite things to accomplish in genealogy is matching up family stories with actual documentation. 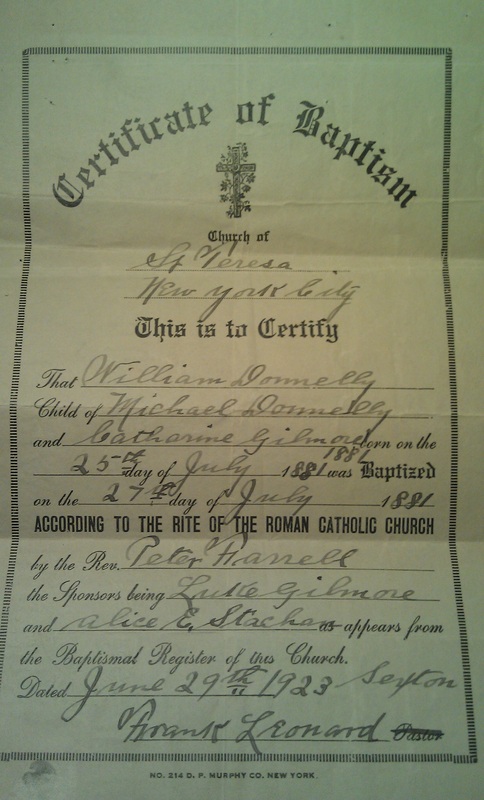 Being able to confirm the truth of a family legend is one of the most gratifying things I feel that you can accomplish in researching your family tree. The only downside though is that it often leads to more questions, but in genealogy, questions are a very, very good thing to have. 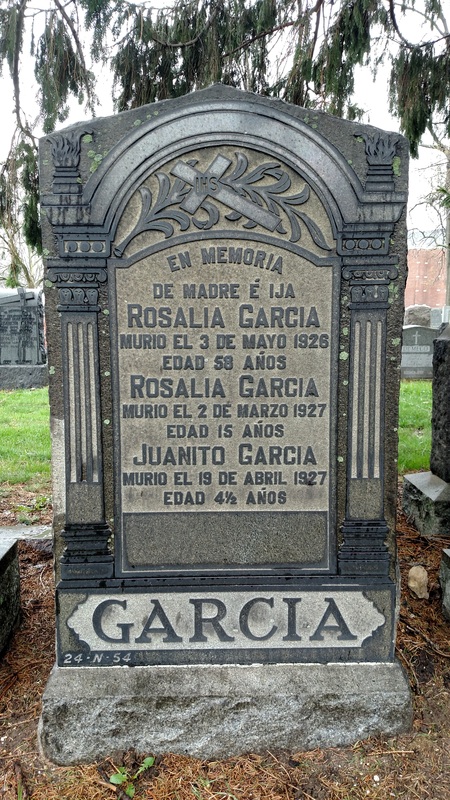 After discussing my previous post with my Grandmother, I learned that Juanito and the younger Rosalia (15 years old) were indeed Louis Garcia’s children and that her grandmother (Louis’ sister – also Rosalia) was their godmother. 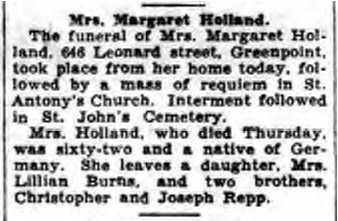 Obviously, being one of the first and clearly unexpected deaths experienced by the family in America, the only plot available was probably the plot in St. John’s Cemetery where my 3x great-grandmother had been buried. 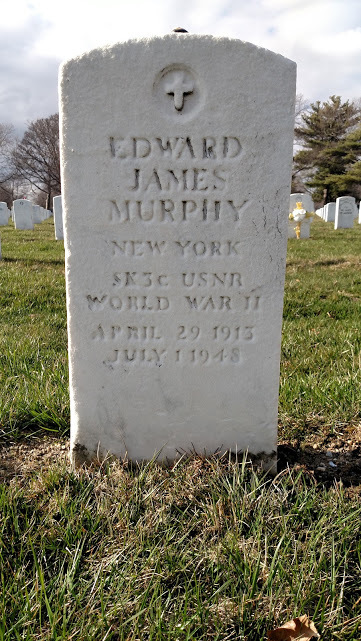 So, it makes sense that Louis’ children would be buried with his mother (who from what I can determine – came to the United States without her husband and thus was not buried with her spouse). 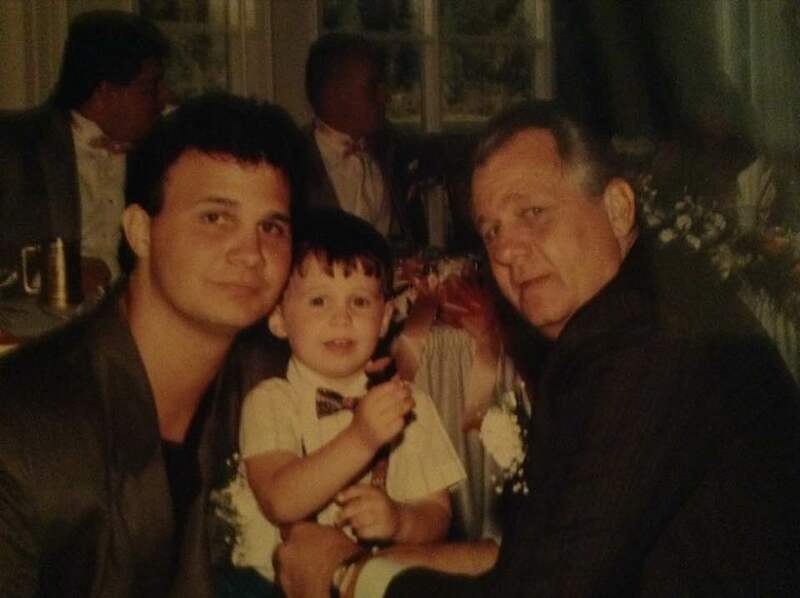 What a rough time – 3 deaths in a matter of 1 year. In fact, Juanito and his sister Rosalia died within almost a month of each other. 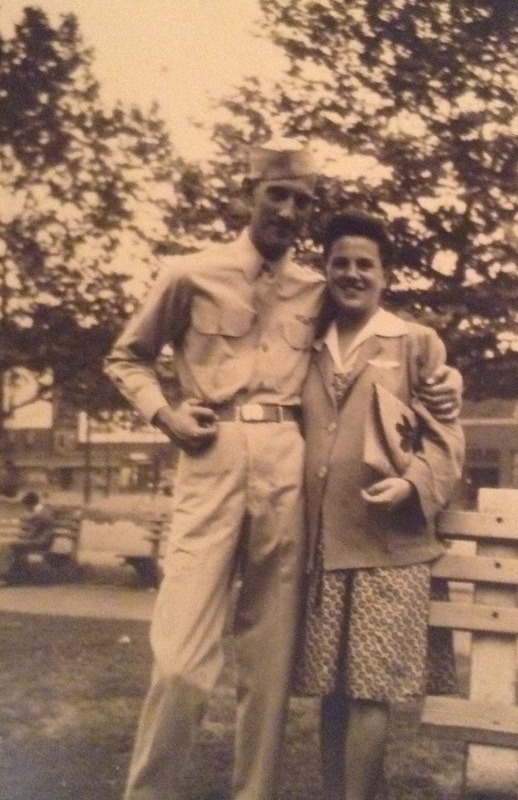 According to my grandmother, they both died from appendicitis. By running some new searches, I uncovered their death certificate numbers, and once I am able to procure them, I will be able to confirm their exact cause of death. The searches I ran were on both Familysearch.org and Italiangen.org. 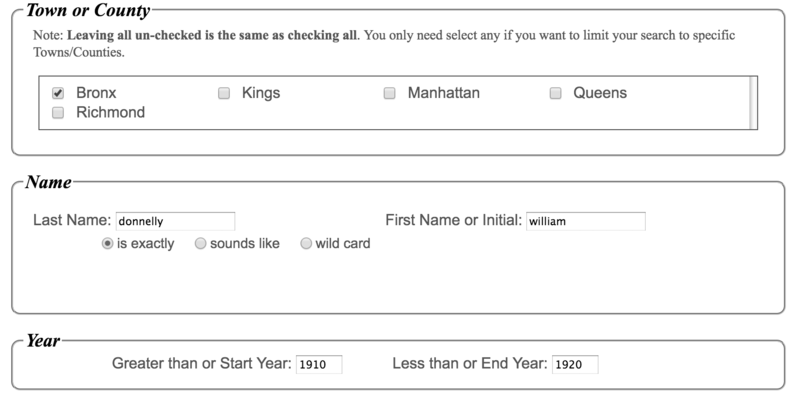 As I already mentioned in my last post, the databases made available by the Italian Genealogical Group are extremely valuable for anyone with ancestors from New York City. 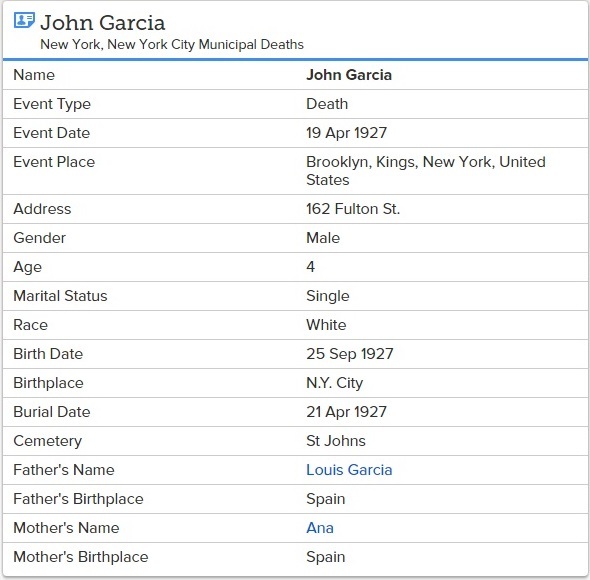 The documents available on FamilySearch are also another great tool and unlike the database at Italiangen.org, they include more information on the death records of those who died in New York City. Equipped with the dates found on their headstone, I was able to easily find both of them in the ItalianGen database, which also included the death certificate numbers. 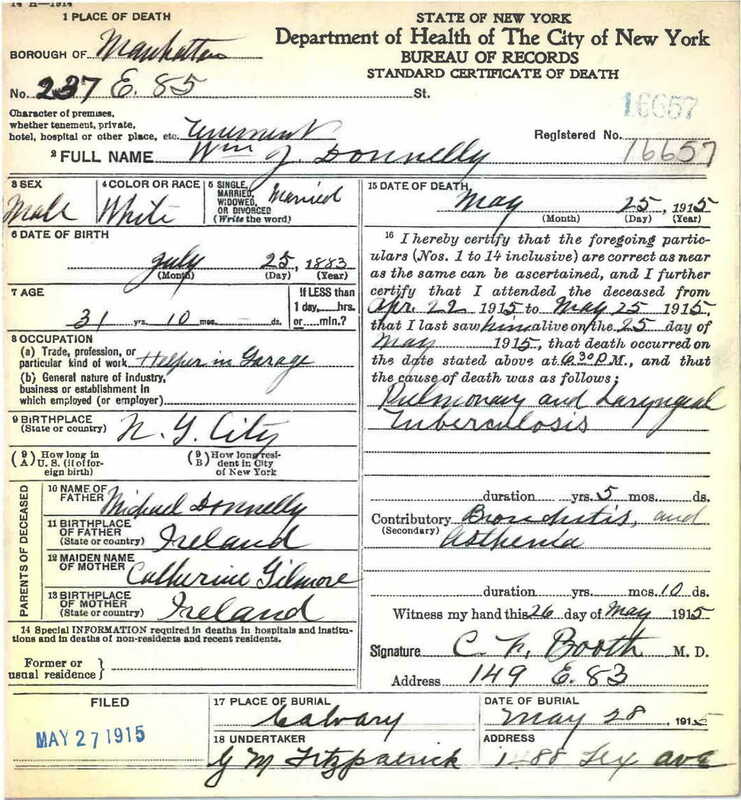 It’s always easier when you have the certificate number when ordering vital records (birth, marriage, and death) from New York City. It was at FamilySearch though that I was able to learn something that I did not know before. The name of Juanito and Rosalia’s mother was Anna Sanchez. 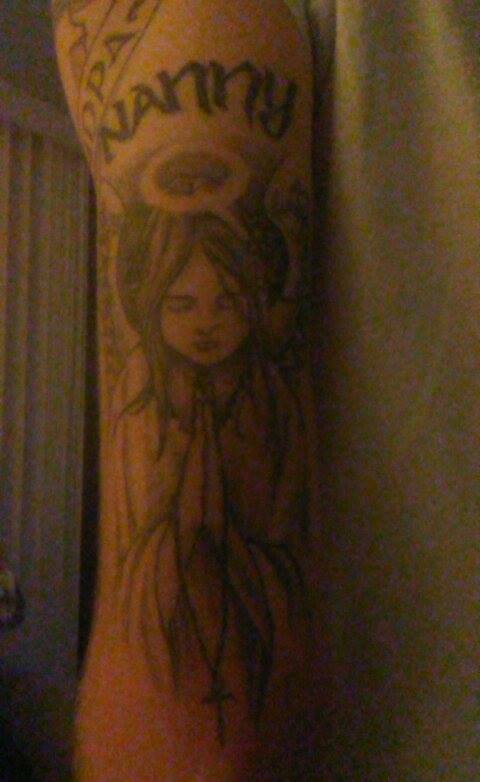 The father listed on each record was also Louis Garcia thus confirming that I had the right death records. Clearly, I had the right people. 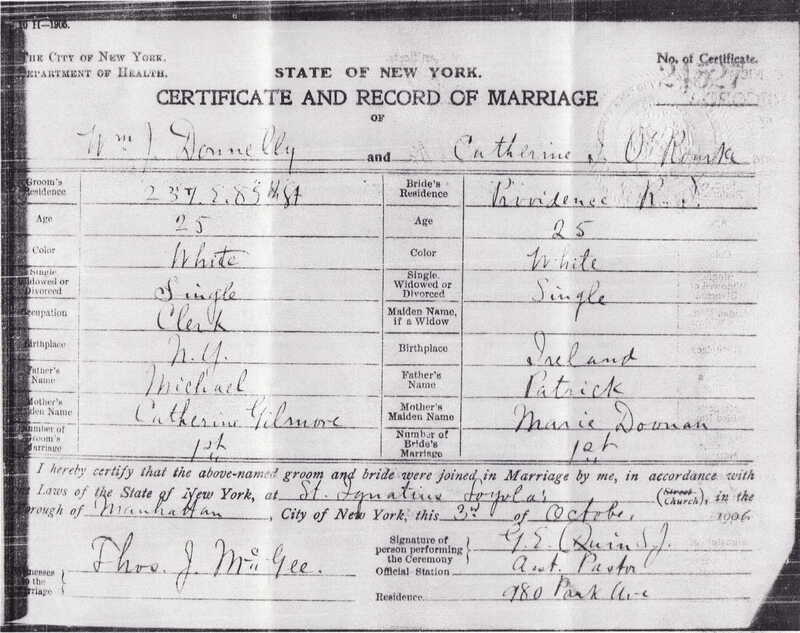 As you can see, there are some irregularities in the FamilySearch results. However, this is more than likely due to a transcription error. Many records are entered into databases by volunteers thus human errors sometimes happen. 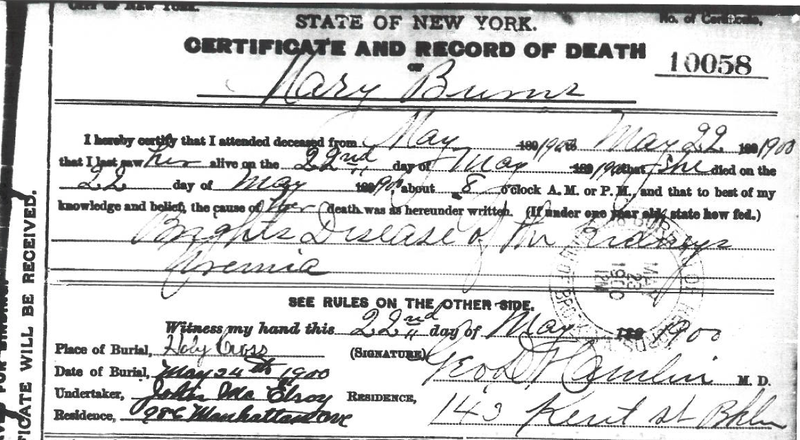 The best thing for me to do now would be to order their death certificates so I can actually view the record myself. The discovery of Anna (their mother) led me down on a path that revealed additional cousins that I had never heard of before. 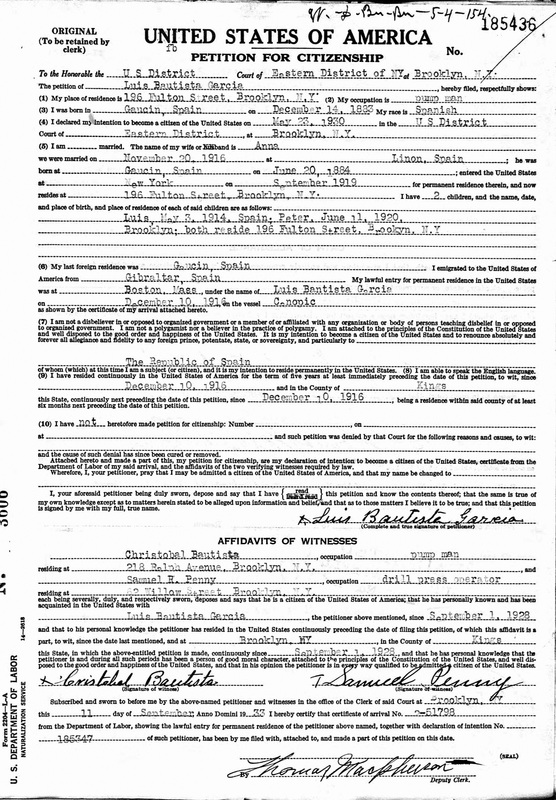 I was able to uncover census records and Louis’ petition for citizenship on Ancestry.com with details about the entire family unit, which I wouldn’t have been able to do without the information available on the death certificates and of course by visiting their gravesite. 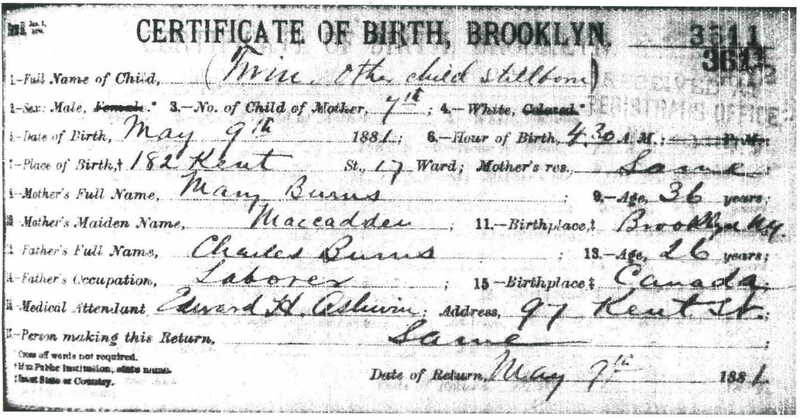 Louis Garcia’s family in 1925 lived at 162 Fulton Street in Brooklyn, New York. This is the only record where the entire family is listed together. Now without Rosalie and Juanito, Louis, Anna and their remaining sons Louis Jr. and Peter are still on Fulton Street in Brooklyn. 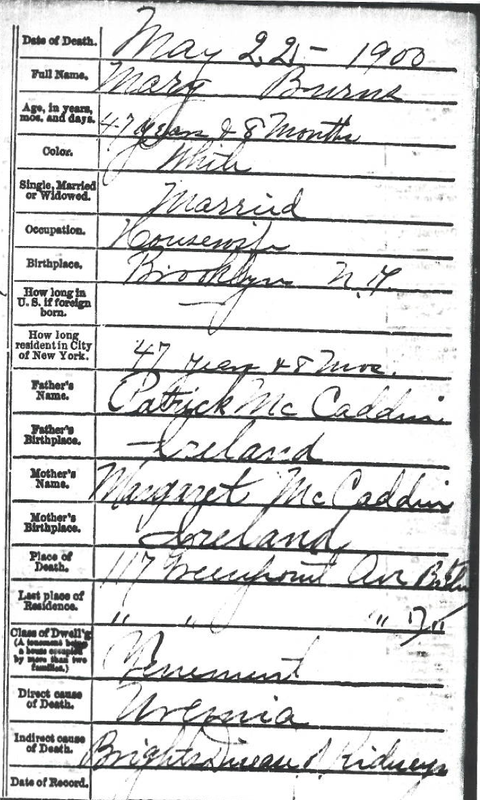 In this census record though, Louis Jr. is listed as being born in Spain rather than the United States. In the remaining part of the record, it actually lists Louis and Louis Jr. having emigrated in 1917 and Anna in 1919. 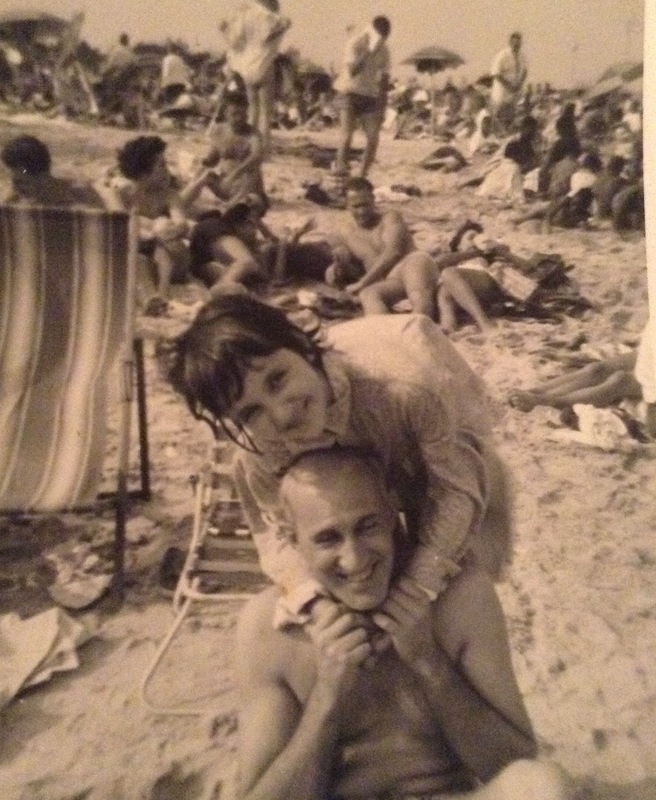 In 1940, only Peter was still living with Louis and Anna (still on Fulton Street in Brooklyn). 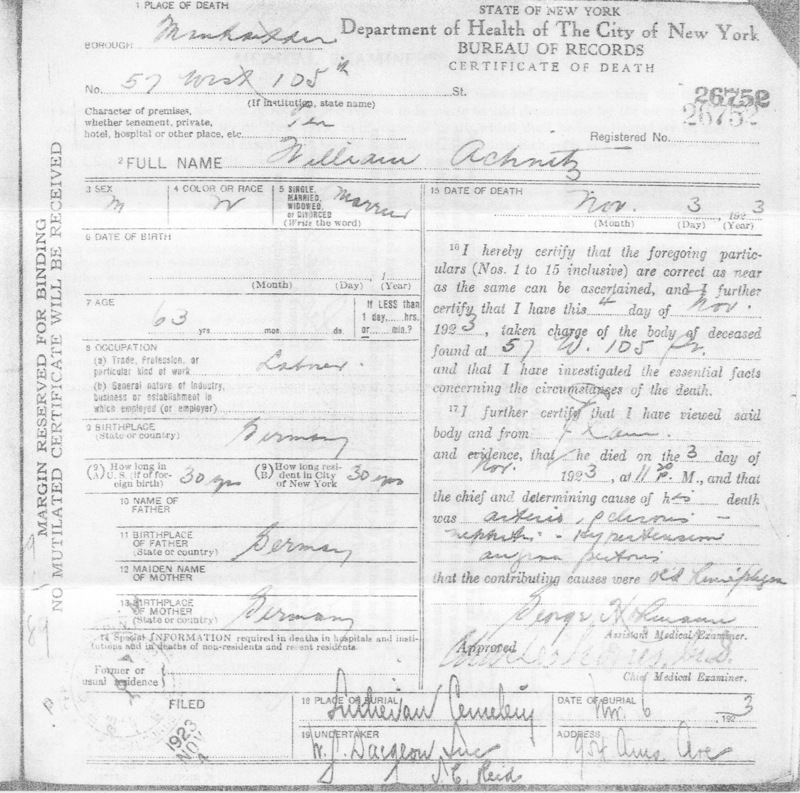 Louis is also listed as having been naturalized whereas Anna was not. 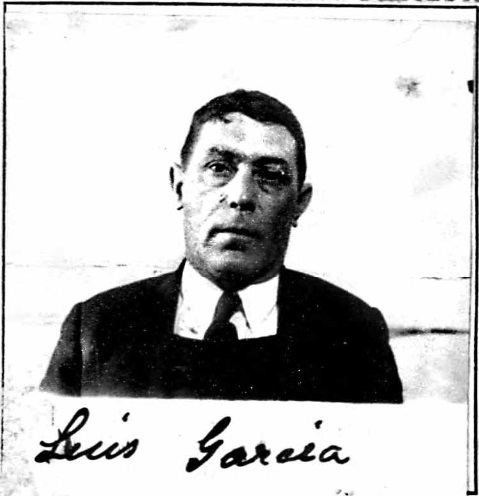 In 1933, Louis Garcia became a citizen of the United States. This is all that I have been able to find for Louis and Anna Garcia. Despite the heartbreaking circumstances that I first came to uncover this information, I am happy that I am able to ensure that they are never forgotten. 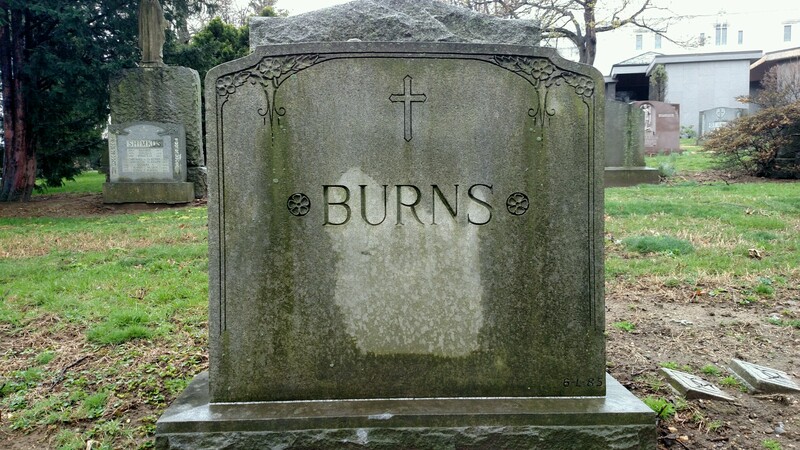 Where are Louis and Anna buried? Is it possible that any of their kids are still alive? 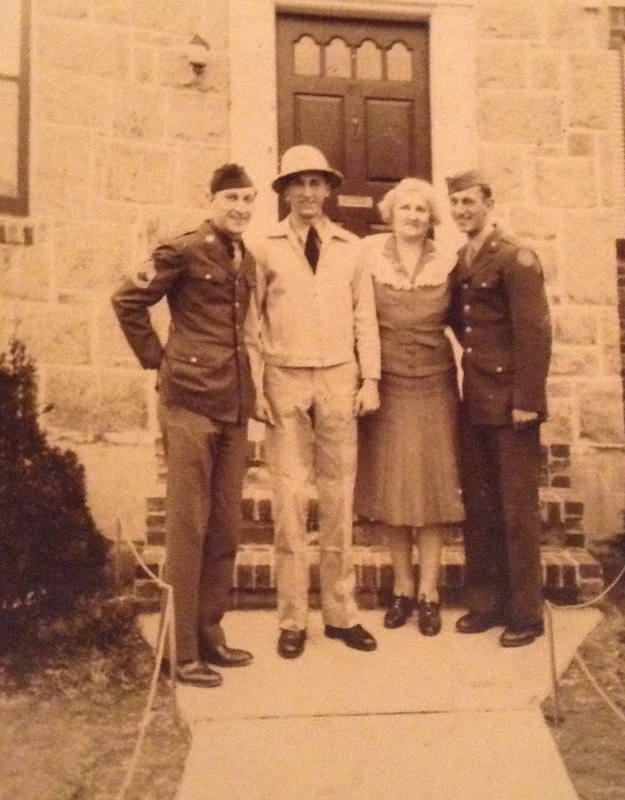 How close were they with my great-grandmother and her sisters? What was their life like in Spain? Questions that I am nonetheless glad to have. Think about this for a moment. 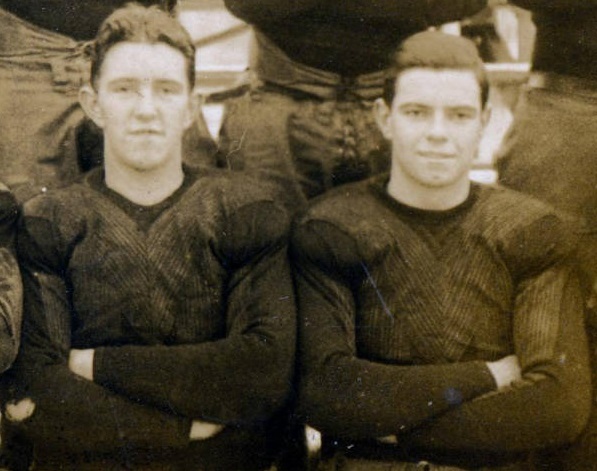 Both of these children – my cousins – passed away at such a young age (4 and 15), and it was only by visiting them that I would have ever even known that they existed. So many times, this is the end of the road. 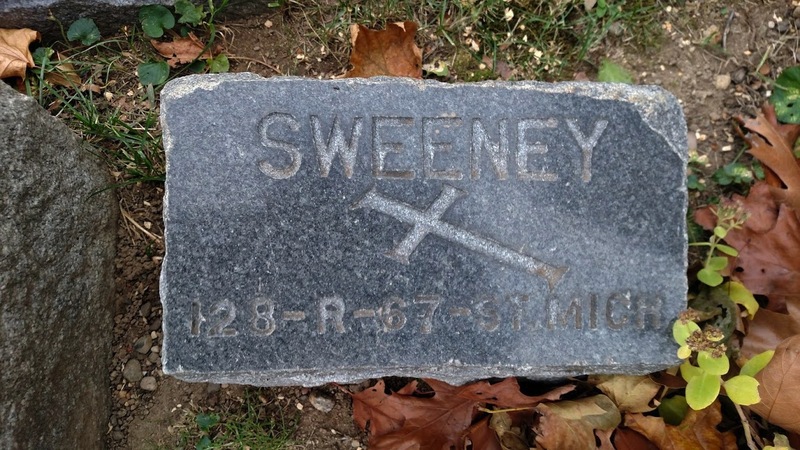 As family historians, we typically do all of this research to figure out where our ancestors were laid to rest. To get that moment where you are physically standing on the ground where they are. To get that moment where you sense that they are there with you. I don’t think there is anything more intimate in genealogy. Sometimes though it is the complete opposite – we visit a gravesite first in order to get that new lead that leads us down a completely new path of research. Indeed, he did. To help decipher the numerous Rosalies in my tree, please see the below tree. 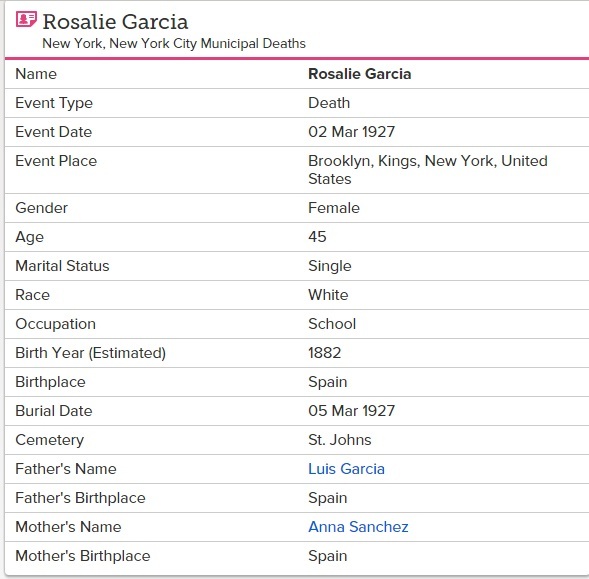 My 3x great-grandmother Rosalia Bautista Moya had three children with Louis Garcia (Louis, Rosalia, and Pedro). Louis Garcia married Anna Sanchez and had Rosalie, Louis, Peter, and Juanito. My great-great grandparents were Juan Fariñas and Rosalia Garcia and they had Josephine, Louisa, and my great-grandmother Frances. As far as I know, Pedro Garcia never married and had no children. 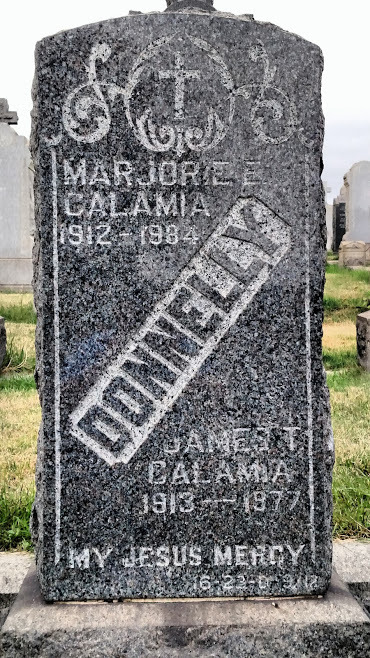 One day I hope to be the one to add my great-great grandmother’s name to this stone.